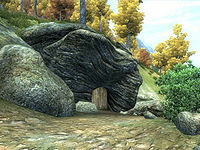 Glademist Cave is a small cave between Chorrol and Bruma containing monsters (quest-related). 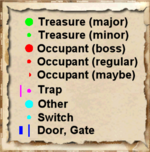 It contains only one zone, Glademist Cave. This cave can be fully explored before the quest; the enemies will then be monsters and animals and Ajum-Kajin will not be present. During the quest, you will have to kill all seven Blackwood Company Guards to advance. This cave contains 5 Cairn Bolete plants and 14 Wisp Stalk plants. 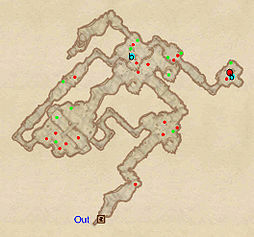 This location's map marker (M on map) is named Glademist Cave (editor name GlademistCaveMapMarker). The entrance door is ENE of the marker, 50 feet away. Upon entering from door Out, everything seems quiet at first; after a few twists and turns you will encounter the first Blackwood Company Guards standing near a bonfire. Because of the quest requirement, you will have to dispose of them; remember to loot the corpses for some high level equipment. Go through the wooden door to the south and follow the narrow tunnel for a minor loot chest. Backtrack to the corpses and follow the northern path until you reach a campsite with a bedroll at b and a chest. Take the southern path until you emerge in a large room with a pit in the middle. Two Blackwood Guards can be found across the bridge, so pick the fight and continue on through the wood door. The next large room is guarded by another Blackwood Guard and you will have no choice but to fight. Loot the nearby chest and proceed through the northern tunnel, with caution, as the two final guards can be found just around the corner. Dispose of them, make sure to examine the cupboard and the various containers, then finally enter the secret hideout of your target at Q, Ajum-Kajin. This page was last modified on 25 March 2018, at 02:54.